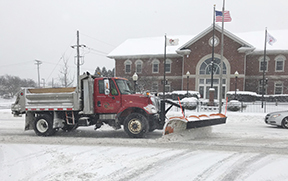 The Village of Westmont continues to conduct snow removal operations with a priority on keeping all main streets open for emergency vehicles and residential use. To help in these efforts, residents and businesses are reminded that after an accumulation of two or more inches of snow, parking is prohibited on any street for a period of eight hours after the snow has stopped falling. If snow removal is still needed after the eight hour period, parking is prohibited until operations are completed. When snow plows are clearing the roadways, some snow gets pushed back into driveways. Please make sure to not return this snow back into the street, but instead shovel snow to the parkways. Westmont property owners are asked to clear sidewalks adjacent to their property at their earliest convenience following a snowfall. Landlords are responsible for keeping sidewalks, parking lots, and all common areas, including open stairwells, free from hazardous conditions at all times. Residents are encouraged to help the Fire Department by shoveling out fire hydrants. Shoveling a three-foot perimeter around a hydrant and a path to the hydrant from the street will allow quick access in the event of an emergency. Working together, we can make sure that our roads and sidewalks are safe for everyone.